Mister Rogers arrives with a raincoat and sandals and remembers a time he walked along a beach during a windy storm. Mr. McFeely delivers some cleaning supplies belonging to Audrey who is busy cleaning ovens at Brockett's Bakery. A phone call from Audrey confirms that she will be stopping by later. In the Neighborhood of Make-Believe, Grandpere's Pommes Frites sign is still purple as a result of Lady Elaine Fairchilde's magic from the previous week, depsite the fact that the rest of the Neighborhood has been returned to normal. Robert Troll goes to find Lady Elaine who is at the Museum-Go-Round wearing a pair of headphones. Along with the others, Lady Elaine unsuccessfully attempts to remove the purple with her boomerang, a fan, and a vacuum cleaner. At the suggestion of Elsie Jean Platypus, the purple comes off with soap and water. Lady Elaine apologizes for the mess and is given some pommes frites (French fries) by Grandpere. Back at the house, Mister Rogers sings Good People Sometimes Do Bad Things. Audrey arrives to clean the house and Mister Rogers' helps her mop the kitchen floor. Leaving Mister Rogers' house, Mr. McFeely picks up Audrey's hand broom and says, "I'll just whisk away!" 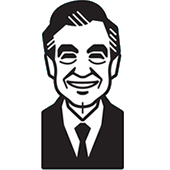 Mister Rogers responds appropriately: "You're a regular comedian, Mr. McFeely!" Looking over his bill from Audrey Cleans Everything, Mister Rogers finds a charge for a second window washing. According to Audrey, "That's when you had Al Worden coming and you called the office and wanted someone right over." Al Worden visited Mister Rogers' house on Episode 1229 and Episode 1230. A similar film about the windy beach is also seen in Episode 1289.